Hello everybody, and welcome to Hacoder. This is, your friend, Webster, and today I am going to tell you how you can create your own Customized Run Commands in Microsoft Windows OS. So, now, lets get started! The Run command on Microsoft Windows Operating System allows you to directly open an application or document with just a single command instead of navigating to its location and double-clicking the executable icon. However, it only works for some of the inbuilt Windows programs such as Command prompt (cmd), Calculator (calc) etc. But now, I will teach you exactly how you can create your own customized Run commands for accessing your favorite programs, files and folders. Click on “Browse”, navigate to: Program Files -> Internet Explorer from your Root drive (usually C:\) and select “iexplore” as shown in the above figure and click on “OK”. Now click on “Next” and type any name for your shortcut. You can choose any name as per your choice; this will be your customized “Run command”. In this case I name my shortcut as “ie“. Click on “Finish”. 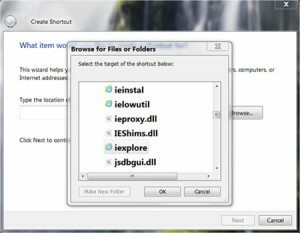 You will see a shortcut named “ie” on your desktop. All you need to do is just copy this shortcut and paste it in your Windows folder (usually “C:/Windows”). Once you have copied the shortcut onto your Windows folder, you can delete the one on your Desktop. That’s it! From now on, just open the Run dialog box, type ie and hit Enter to open the Internet Explorer. In this way you can create your own Customized Run commands for any program of your choice. Say ff for Firefox, ym for Yahoo messenger, wmp for Windows media player and so on. To do this, when you click on “Browse” in the Step-3, just select the target program’s main executable (.exe) file which will usually be located in the “C:\Program Files” folder. Give a simple and short name for this shortcut as per your choice and copy the shortcut file onto the Windows folder as usual. Now just type this short name in the Run dialog box to open the program.